(CNN) – The highest-ranking officials on the House intelligence committee continued to warn Sunday of the increasing cybersecurity threat to the U.S. economy and national security. 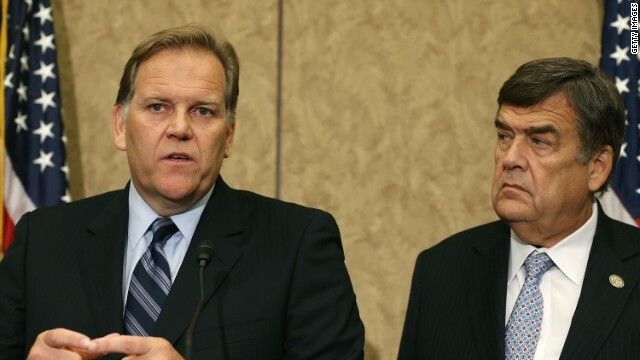 Republican Rep. Mike Rogers, the committee's chairman, spelled out the different levels of cyberattacks during an appearance on CNN's "State of the Union" and cautioned that the worst of those - a debilitating hit by a terrorist group – could become reality. "Here's the other problem," he continued. "A nonrational actor, Iran, is already at the shores of the United States with cyberattacks, and that's what's so concerning. I think that's what all of us - Dutch and I - have been working so hard on." Outlining the different levels of threats, Roger said the simplest is the criminal threat, in which attacks are launched to steal credit card information and money from banks. "The credit card in your viewer's wallet today will get hit about 300,000 times," Rogers told CNN's chief political correspondent, Candy Crowley. Cyberespionage, he said, is the next level of threat. He pointed to China as the biggest enemy of the U.S. in terms of stealing intellectual property and trade secrets that can ultimately make China more competitive in the world market. That costs American jobs, both congressmen said. Ruppersberger argued the amount of trade secrets stolen from the U.S. by China amounted to the "largest amount of theft in the history of the world." But the most worrisome attack, they said, would be the doomsday scenario, in which a terrorist group launched a military or cyberattack that could shut down financial institutions or electrical grids on a massive scale, causing significant damage to the economy. Both congressmen said it is one of the few issues that keep them awake at night. Appearing before a congressional hearing last week, Director of National Intelligence James Clapper said he believes cyberattacks pose more of a threat to the U.S. than a land-based attack by a terrorist group. "It's hard to overemphasize its significance," he said. "We see indications that some terrorist organizations are interested in developing offensive cybercapabilities, and as cybercriminals are using a growing black market to sell cybertools that have fallen in the hands of both state and nonstate actors." President Barack Obama has also made cybersecurity a priority this year. On the same day as his State of the Union address in February, the president issued an executive order aimed at stopping cyberespionage against federal agencies and businesses. He also met with CEOs on Wednesday at the White House to discuss the growing threats posed by cyberattacks. In an interview that aired Wednesday morning, however, Obama downplayed recent comments from Rogers, who said the United States was in a cyber "war" with China. "There's a big difference between them engaging in cyberespionage or cyberattacks and, obviously, a hot war. What is absolutely true is that we have seen a steady ramping up of cybersecurity threats. Some are state-sponsored. Some are just sponsored by criminals," Obama said in the interview with ABC News. Both Rogers and Ruppersberger on Sunday urged Congress to pass their bipartisan bill on cybersecurity, which they reintroduced in February. It passed the House in 2011 but failed to gain enough support in the Senate. "We have got to stop this," Ruppersberger said. - CNN's Alexander Mooney contributed to this report. The president downplayed the threat and then said it was a problem? Talk about double talk Obama get get your head outta your you know what and quit making all this time taking poor leadership problems. Do your job in a timely efficient manner like working Americans have to do so you can move from one problem to the next, we all do that everyday in the real world. what costs America jobs are companies who take jobs overseas. if companies – including the government – are so worried about cyber security, make a law that demands all of our trade secrets and intellectual property "stuff" is manufactured or made in the US. it's gotta be easier to poach information when it;s sitting in your backyard. You were the same guy who was blaming Obama for not putting on a scuba suit and fixing the BP oil spill in the Gulf of Mexico. You sound like GW Bush , Invading Afghanistan then moving on to Iraq . #3 TRILLION DOLLARS . Heck of a job , man dew ,heck of a job. There is a tendency in our country to wait until the very last minute to address + find timely solutions to important issues. Cyber-security, the Saber-rattling of North Korea, Iran's nuclear capabilities are extremely concerning, just to name a few. These are not new issues, they're just getting bigger! Let's not procrastinate any longer + try + come up with some answers before its too late! – @Marita. Real sinple fix. Disconnect the grid and the banks from the internet, and put people back to work managing things. Why is things so complicated? The gadget makers should be paying for security measures to support the garbage they sell instead of lobbying to kill the cybersecurity bill so they could continue to steal legally. Yes, we are all at risk since security always suffers ahead of profits. The threat posed by foreign entities is dwarfed by our own domestic hoodlums known as big business!!! We should deduct the costs, including royalties, from what we owe China and any other countries involved. Costs of stolen secrets that is. this guy has no idea how inter-tubes work. and my guess is he wants to shut it down for non-military – commercial uses. Why is this a president's problem? Government has no control with out internet usage. I'm sure this has plenty to do with creating fear surrounding the internet in order to get CISPA through. If I were a foreign country who wanted to do harm to the US and I did not want to be violent or have the money to have an army to do harm, cyber attacks are by far the cheapest, easiest, non-violent way to go. In fact, if I were in a poor foreign land, I would get my education is the US or some western University, then go back home and use my new skills to cyber attack the wests computer systems. The US and in fact any other nation must pour resources into making our computer systems fool proof. That means all computer geeks unite for the good of protecting our nations. When the lights get turned off you'll be....................................................................in the dark. I see. The problem is the vast collection of data and cyber attacks by "non-rational actors" and "non-state entities." When the US government and big business do it, it's good. When someone else does it, it's bad. Glad we got that moral relativity cleared up. Because there is more money to be made when a problem exist . And besides the rest of the gov officials are busying finding way to take more $$ from the tax payer. My first question is why the hell are our computer systems that run the power grid even accessible to outside data? Oh, a virus got in through an employee USB drive? Why can employees plug portable USB drives into a computer running a nuclear plant. Those systems should be completely isolated from any type of network. There should be no hardwire in or out of the building, and there should basically be a a a main and backup hard port into the system that is heavily secured and only accessible by the system administrators. Sadly, I know this to not be the truth. Our power grid computers are out there dangling like a free sausage. Probably so the morons running them can play Warcraft on the computers while they are at work. Sadly, I know this to not be the truth. Our power grid computers are out there dangling like a free sausage. Probably so the morøns running them can play Warcraft on the computers while they are at work. As an administrator for a mid size company, I can say that I see daily attempts from off shore IP addresses probing our firewalls. SPAM using various phishing attacks account for more e-mail that is filtered than legitimate e-mail (over 90% of e-mail is filtered due to various issues). Much of the SPAM originates off shore. A steady constant is China, though they are not alone in the probing and attacks. If you wanted to take down a country like the United States, you gather all the financial data and then make one big withdrawal at the same time. Even if the banks can undo the damage, all the accounts would be frozen. Like fools we let places like China manufacture the very computers we use for everything . So guess who is going to be best at coming after the very machines they build ! What would it take for China to insert a spy chip that could even be used on corporate america and or our own armed forces ? We are but fools and that cheaper labor could cost us everything ! One of the biggest fears of the corporation today is that the real worth of IT staff be realized in the market. What we are seeing is the end effect of years of low balling on IT work and accepting subpar results.